"This is the best cream drink in the whole entire world. So if you like creamy drinks you will be a slave to the Jedi Mind Trick! It is radical! Please Don't Drink and Drive!" Fill a large glass with ice. 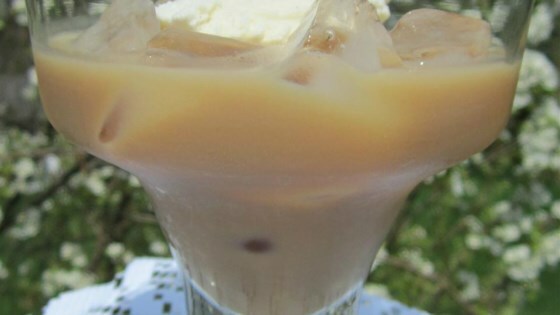 Pour in the spiced rum, Irish cream, coffee liqueur and amaretto. Fill the rest of the glass with half and half, or vanilla ice cream. Whoa! That's all I have to say. This was a pretty good drink. Whoa. Holy sweet drink. I cut back the half-n-half to a 1/4 cup. This one's a sipper, not a throw back. Good, but way sweet. I was out of light cream so I mixed heavy cream and skim milk to make up the rest of the drink. That all being said, this drink tasted quite good, a nice change from my usual fare. Very tasty. A good mix.